Many experts say that excessive traffic congestion on roads and surging infrastructure costs in almost all the major business cities of the world are forcing companies to adopt “virtual office” models in order to telecommute to work. 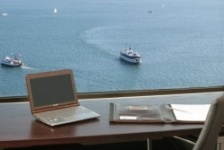 So what is a virtual office Toronto and what is telecommuting? According to Wikipedia “A virtual office is a combination of off-site live communication and address services that allows users to reduce traditional office costs while maintaining business professionalism. Frequently the term is confused with ‘office business centers’ or ‘executive suites’ which demand a conventional lease, whereas a true virtual office does not require that expense.” One problem with the Wikipedia explanation is that the author of the Wiki is mistakenly trying to compare a virtual office Toronto to a Toronto office business centre, when the top Toronto virtual office locations operate out of an office business centre. Without having your virtual office run from a business centre, there is no physical address for clients or customers to send courier packages or meet with you in person. Let’s first look at how large companies are using Toronto virtual office solutions. Companies who do not have a local Toronto office space, but require a prestigious Toronto address for employees who work remotely, will use a virtual office address and telephone service to maintain a corporate presence. All mail is sent to the Toronto virtual office location where it can be picked up or forwarded to private homes of the workers. When a client or customer phones the local exchange telephone number, their calls are routed through the central receptionist who handles the calls in a manner that the client has requested. Calls to their Toronto virtual office can re-direct to individual employees home or cell numbers, or sent to voicemail for them to pick up at their convenience. When smaller businesses are looking to get started, the budget for office space is low, so most entrepreneurs choose to run their business out of their home. While this may save them money, it could also be costing them credibility and potential customers. Without a professional appearance that comes with having a business address, customers may overlook dealing with them in favour of going with a provider who has a proper business address. Having a virtual office Toronto with a Toronto mail service address at a business centre demonstrates to customers that you have a proper Toronto business address. Telecommuting is a work arrangement in which full or part-time employees enjoy flexibility in working location and hours. They are able to avoid the daily commute to the office and work remotely using telecommunications technology and access to a centralized work space. Many Toronto virtual office users find themselves working from home or other locations where they are able to get work done as well as have internet access. A person who telecommutes is known as a “telecommuter”. Toronto virtual offices are often used as mini hubs for larger companies without a local office who has telecommuters and wants to maintain the privacy of its workers who work out of their homes – by having a business address that is not the home address of the workers. This is especially good for companies with multiple Telecommuting workers. When a group of workers needs to get together for an in-person meeting, they can reserve a boardroom and only pay a daily or half day price. This saves the company money by not having to pay monthly rent on a meeting space that is only used on an occasional basis. No matter what size the company, a virtual office Toronto can be a great solution for those who are working from non-tradition office spaces. There are plenty of other benefits available to Toronto virtual office clients at Telsec, including access to boardrooms, Toronto meeting rooms, large conference rooms and day offices.